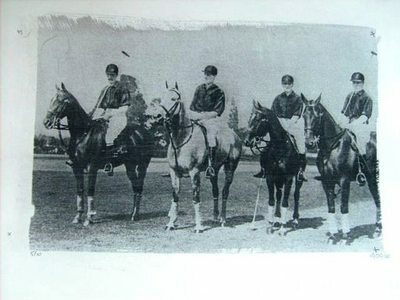 A photograph on handmade paper of the winning British team. Image size approx 28cm x 18cm. In ivory coloured mount. The photograph is part of a very small limited edition of 10 sets of each. These last few images comprise examples from the proof run produced by Valerie Halford to commemorate the victors of the Westchester finals. The technique is a screen print-like finish from photographic images. The series was completed by Valerie in 1997 to celebrate the England Team's first postwar victory in The Westchester in 1997. Images may differ slightly from each other owing to the nature of the technique.